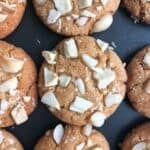 This easy recipe for Healthy White Chocolate Macadamia Nut Cookies is healthy, gluten free, and made with simple ingredients. They are slightly chewy and are soft to the touch, and rival the traditional cookie. In a large bowl, mix together egg, honey, coconut oil, and vanilla. In a small bowl, mix together almond flour, salt, and baking powder. Add in some nuts and chocolate, saving some to place on top. Let dough chill for 30 minutes in fridge. Scoop out dough (about 2 tablespoons) and flatten slightly on baking sheet. Top with more nuts and chocolate. Bake for 11-13 minutes or until slightly golden. Store in airtight container on counter once completely cooled.